Travelers and locals alike always look forward to the fall in the Smoky Mountains. And for good reason, too. Every year as summer fades into fall and the temperatures begin to drop, the beautiful shades of green that paint the colors of the trees during the spring and summer explode into a brilliant tapestry of reds and oranges. Fall in the Smoky Mountains is one of the best times of year to visit due to the changes of scenery that naturally occur in the mountains. If you have never been in the Smokies during the fall season, make plans to change that this year. Here are some ways to enjoy the fall season as you and your family plan your Smoky Mountain vacation. This one might sound simplistic, but one of the best ways to take in the beauty of fall in the Smoky Mountains is to drive up and explore one of the motor trails. Two of the most popular motor trails amongst both visitors and locals are The Roaring Fork Motor Trail and the Cades Cove Loop. The Roaring Fork Motor Trail is a 6-mile motor loop that takes motorists on a scenic loop through the Smokies. Located off the main strip in downtown Gatlinburg it is centrally located and easily accessible. The Cades Cove Loop offers a different experience than The Roaring Fork Motor Trail. Cades Cove Loop takes motorists on a scenic drive through a beautiful valley that is surrounded by trees undergoing the fall change of colors. Cades Cove also has ample opportunities for guests to see wildlife in a natural setting. History buffs will especially enjoy Cades Cove as varying structures from the 1800s have been restored and are still in their original locations. 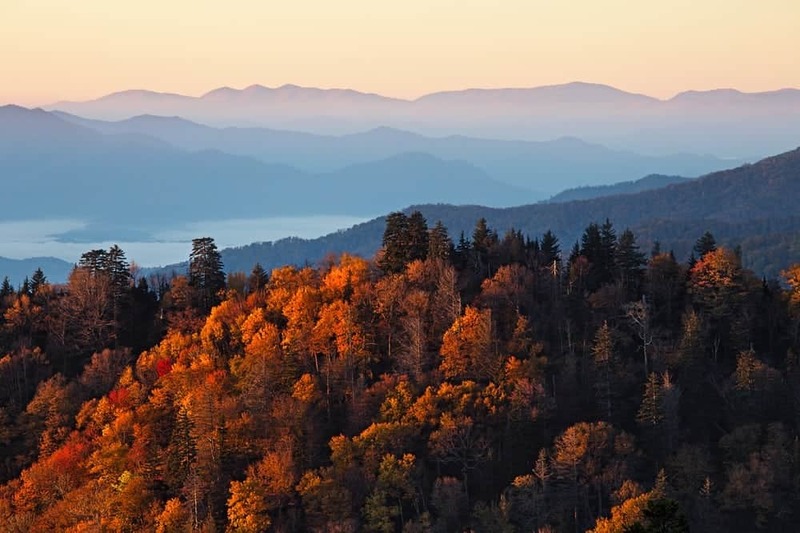 It’s time for you to go ahead and make plans now to visit the area to truly experience fall in the Smoky Mountains. We promise you’ll be glad you did. So, take a look at all of the cabins in Gatlinburg offered by Stony Brook Cabins. We will help you choose the most affordable cabin that meets all of your needs.